Leading Manufacturer of grinder pump from Mumbai. We are engaged in the offering the Grinder Pump that is highly efficient in handling the slurry. Used in pressure sewage system. 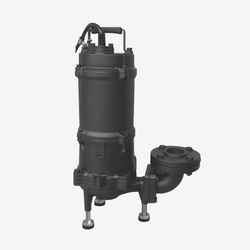 transferring wastewater from individual residences, apartment, buildings, recreational developments, motels.These pumps have fetched a wide demand in the market. Known for wear and tear resistance, these pumps are highly acclaimed among the clients. Durable heavy duty finned cast iron construction. A grinder is a complete unit, lightweight, compact, and portable, easy to be installed. An excellent vortex impeller and casing water cavity housing design. Provide high efficiency and power saving, handling ground slurry and sewage without clogging or binding. Drainage of wastewater from individual residences, apartment, buildings, recreational developments, motels. Transferring waste water of commercial buildings, industrial plants, wastewater sampling, small hospitals. Double protection at connection box: barrier grommet, barrier epoxy, prevent water ingress to the motor area, assuring a long-term reliable operation. Additionally, epoxy encapsulation and stripped leads positively eliminate wicking from the cable. The dual silicon carbide mechanical seal system and extra oil seal protection protect the motor from sewage contamination, to provide you exceptionally long pump service life. Radial cutter and cutter ring: corrosion resistant material, hardened to 55 - 60 Rockwell C.